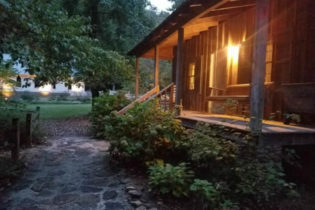 The two cabins in Capps Cove of Oneonta,AL will bring back an era long ago. Light a fire, rock awhile, swing awhile, listen to the birds, listen to the quiet. The Little House on the Prairie cabin (above) is made of board and batten construction with a bedroom and sitting area downstairs; and with the sleeping loft upstairs, the cabin sleeps a family of four. There is a private bath with tub/shower, and scented soaps and bathrobes. Sit in the rockers and enjoy a game of checkers in front of a warm fire in the stacked stone fireplace. Enjoy your continental breakfast basket; the barbecue grill (charcoal provided); and the small microwave, refrigerator and complimentary popcorn, cheese, crackers, teas, coffee and soft drinks. This cabin sleeps up to four adults. There are several locations in the 21-acre Capps Cove Lodging and wedding facility that are perfect for a destination wedding. A white picket fence welcomes you to the small wedding chapel with an antique pump organ. A big red barn can be the setting for a rustic wedding or an elegant reception. And there is a beautiful spot to say your vows under a pergola on the lawn overlooking the Blackburn River. 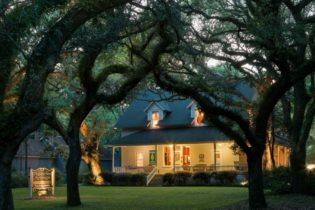 Escape from the hectic pace of everyday life, relax, and immerse yourself in luxury at our historic Alabama bed and breakfast. Choose from 5 beautifully appointed guest rooms with private baths, enjoy unforgettable gourmet three-course breakfasts each morning, and experience the finest in gracious service and southern hospitality. Ideally located a quick drive to the coastal towns of Gulf Shores, Orange Beach, Foley, Point Clear & Fairhope! Our historic property welcomes all travelers and offers the modern amenities they require including free Wi-Fi, daily made-to-order breakfast, turndown service with chocolates, A/C, parking, and concierge services. Romantic packages, massage services and more are available for an additional fee.